When I received a travel-sized Smashbox Hyperlash Mascara with my first order from Order Makeup UK (with a bunch of other freebies, woot!) I didn't take much notice of it, until I took a look at the wand. It was covered with short, stubby bristles throughout - except for one side, which had longer bristles, like a comb. This made me want to give it a shot. Formula: Thick, looks "glossy", and very, very black. Paraben-free mascara alert! Smell: Subjective; didn't bother me at all, though I can't stand a whiff of Masterpiece. Applicator: Wand, as I said, has short spiny bristles throughout and a longer "comb" on one side. Reaches all corners. 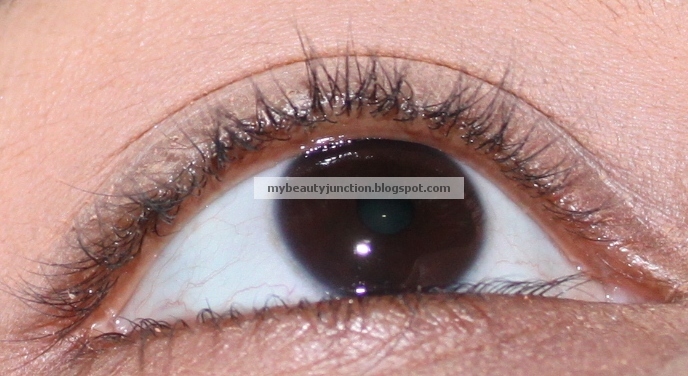 Drying time: Longer than Masterpiece and Lancome Hypnose Doll Eyes (read review here). Now check out the before and after pictures to see what Smashbox Hyperlash Mascara looks like on me. Note - my lashes are uncurled, as always. As you can see, one coat of Smashbox Hyperlash Mascara makes a huge difference in length and volume (more volume than length). Now for a light-handed second coat, just to brush the lashes out nicely. Oops, some bumping and clumping coming in. I didn't even risk a heavier second coat or a third coat. The same thing happened to the other eye - one more coat and my lashes refused to let go of each other. Bottom line: Smashbox Hyperlash Mascara definitely lengthens and thickens my lashes BUT I recommend strictly sticking to just the one coat. Holy Grail? I'm in favour of Lancome Hypnose Doll Eyes for length, lash separation and layering (see pictures here), though Smashbox gives it a good run for the money in terms of volume.